I'm celebrating the reopening of my Etsy shop with a whole week of card posts! Read this post for more details about card week. This has to be one of the simplest cards I've made yet. There isn't any crazy cutting, embossing, or layering. It's just simple...but lovely. I originally made this as a "ladies'" card, but I think it could quite easily be a "men's" card too, so let's call it a "neutral" card, shall we? The key here is your color choices. You could go with even more feminine or more masculine colors to make it a little less neutral. Start with your standard white card stock base measuring 5.5x4.25 inches once it is folded portrait style (that's 8.5x5.5 inches before it's folded). Cut a white base background measuring 4x5.25 inches. Ink up the edges with a complementary ink. I used an orange since that's the ink I'll be using for the sentiments. I found a white background looked best with all the differing colors, but you can always experiment with different colors. Glue the background onto your card stock base. Use a 1 inch circle punch to punch out 12 circles in differing colors. You can even use patterned papers. e sure you have a few white circles in the mix for your sentiments. 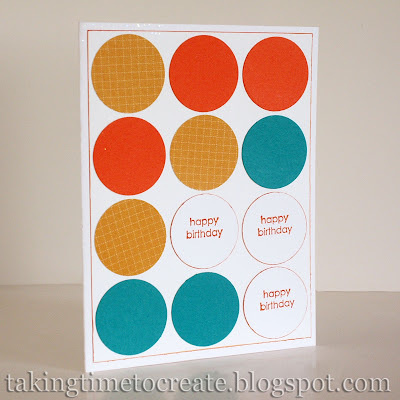 Stamp "happy birthday on the white circles and ink up the edges of those same white circles in the same fashion as the white base/background. Now here comes the most difficult part...line up your circles on the white background and glue them down. I went with a random pattern. You can do this anyway you like though. Some of the circles lined up. It really isn't too difficult to get them lined up. Start with the corners and work your way to the middle. This is a cute card, Erin! I love this card (and your etsy shop - I've added it to my favorites). 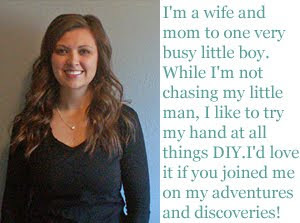 Thanks for sharing this at my link party!